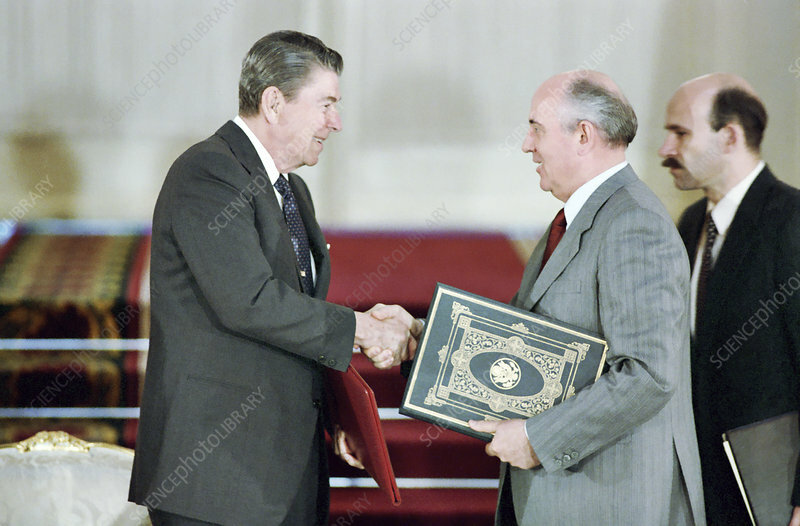 US President Ronald Reagan (left) and Soviet General Secretary Mikhail Gorbachev (right) shaking hands at the Intermediate-Range Nuclear Forces (INF) Treaty ratification in the Grand Kremlin Palace, Moscow, USSR, on 1st June 1988. The treaty required the elimination of all ground-launched nuclear and conventional missiles with ranges of 500 to 5,500 kilometres by the 1st June 1991. By the deadline the US had destroyed 846 weapons and the Soviet Union 1,846 weapons. In October 2018 US President Donald Trump signalled the US's intent to withdraw from the treaty due to concerns over Russian violations.